In February last year, the residents of the small town of Oroville in California’s Gold Country were told a 30-foot wall of water was headed their way. The men and women of the town ran through the streets in panic, and almost 200,000 people were evacuated from the area. These were not extras in a Deep Impact reboot, they were running from a structural failure in America’s tallest dam — the 770-foot-tall Oroville Dam had run into problems with both its main and emergency spillways after days of heavy rainfall and chances of massive breach seemed very likely. As the world watched on with bated breath, the emergency spillway eased pressure, and the uncontrolled release of Oroville’s reservoir didn’t occur. The residents and properties of the town were saved, and California was slapped with a near $1 billion repair bill. 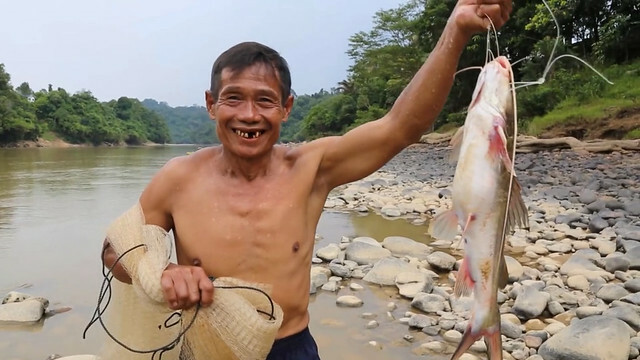 Photo by Fiona McAlpine In 2017, mega dams — which destroy waterways and impact communities, like the one this Sarawak fisherman belongs to, which depend on the river for sustenance — started to go out of fashion. In a very different part of the world, in the face of similar imminent danger, the official response was a dismissal, and a shrug. In November last year, phones started buzzing in villages downstream from Borneo’s Bengoh dam with photos of a leak in the dam’s 200-foot high wall. There is no emergency response plan in place for the area. The rumors were quickly quashed by Malaysian officials, and stories reporting the leak were swiftly erased from the web. The sad fact is that in most parts of the world, the environmental, social, and safety concerns of mega dams have long been ignored. At The Borneo Project, we’ve been working with communities fighting big dam projects in Sarawak for a long time. Today, as we celebrate the International Day of Action for Rivers, we are also celebrating the two-year anniversary of beating the Baram Dam project in Sarawak, which would have been the second-largest mega dam of its kind in Asia. For decades, our allies around the world have been calling out these mega dam projects as corrupt, environmentally destructive, and socially devastating. Oroville was an important wake up call that the international media couldn’t ignore. Throughout 2017, domestically and internationally, we watched on as mega dams finally started to go out of fashion. The global environmental impacts of massive dams are well documented. Worldwide, decomposing organic material at the bottom of reservoirs pump out approximately a billion tons of methane a year. These dams contribute as much to global carbon emissions as the aviation industry. In Borneo, where we work, mega dams have drowned hundreds of miles of rainforest in one of the world’s most vital carbon sinks. On a local level, mega dams transform the biological, chemical, and physical properties of rivers and their surrounding environments. They destroy waterways, so communities that previously relied on rivers for pretty much everything — food, work, transport, cleaning, drinking, cooling off — are often forced to get their water from plastic bottles. Dams have drowned villages, ruined crops, ancestral fruit groves, hunting routes, cemeteries, you name it. And, of course, biodiversity pays a huge price wherever mega dams are built. The creatures who rely on these rivers for clean food and water have to find new homes or die out. From the Mekong Delta to the Amazon Basin, hundreds of indigenous communities have lost their livelihoods and been kicked off their land because of mega dams. By some estimates, about 80 million people have been displaced by dams worldwide. That is just short of the population of Germany. Mega dams and the inevitable involuntary displacement that follows also impact indigenous communities in ways that are difficult for many of us smartphone-tapping, city dwellers to understand: They render extinct familial narratives that are bound with the soil, and entwined with rivers, and land. These are no less real than the environmental and livelihood impacts. Even if none of this tugs at your heartstrings, consider that the economic benefits of mega dams are unclear. While looking into the viability of the Baram Dam in 2015, researchers from the University of California at Berkeley found no evidence of economic benefit. Instead, they found that Sarawak’s 12 scheduled dams would be a net drag on the economy, and generate energy far in excess of projected needs. There would be no future market for them. Research from the University of Oxford has shown that mega dams blow out their budgets during construction and lose a ton of money, not just in Sarawak, but around the world as well. But, never fear, the mega dams are not totally pointless: they would make a few rich men much, much richer in the short term. In Sarawak, for instance, the fabulously corrupt former chief minister Abdul Taib Mahmud’s family has holdings in the companies that received construction contracts for the Baram Dam. Because of (and perhaps in spite of) the evidence that economists and scientists have been spouting for years, in late 2017 finally we saw a mutiny of mega dam projects around the world. In November, Pakistan’s Bhasha Dam project was indefinitely shelved. The epic $8 billion dam would have flooded the villages and farms of over 35,000 people, destroying a bunch of priceless rock carvings to boot. The official line is that Pakistan withdrew from the project due to the Chinese developers’ strict financing conditions. One day later, Nepal announced it was (at least temporarily) cancelling the controversial Budhi Gandaki Dam, which if it went ahead would displace 45,000 Gorkha and Dhading people, with no alternatives being offered for their resettlement and rehabilitation. The Gandaki River also runs along the western border of Chitwan National Park, a UNESCO World Heritage Site and home to one of the last remaining populations single-horned Indian rhinos. This is not a water system to be trifled with. It was also very welcome news when Myanmar soon after announced it is no longer interested in giant dam projects. This comes after years of ill-fated Chinese and Indian backed projects, most notably the Myitsone Dam, the plans for which ended a 17-year ceasefire with the ethnic Kachin resistance, resurrecting a conflict that has displaced more than 100,000 people. And then in a surprise government statement in January, the era of mega-dams in the Amazon basin came to an apparent end. After decades of hydro-expansion, the executive director of the Ministry of Mines and Energy Paulo Pedrosa told the media that the government could no longer stomach mega dam battles against indigenous communities. Despite the fact that few of these projects were cancelled for the right reasons, on this International Day of Action for Rivers, we’re still doing a small, cautious, happy dance on behalf of all the unsung heroes who have been fighting these projects on the ground for years, and are starting to win. While the cancellation of the Baram Dam in Sarawak was a monumental victory for the environment, indigenous rights and for rational thinking everywhere, mega dams remain a huge problem in Sarawak. Communities that were displaced by the Bakun and Murum dams still lack basic necessities, and are struggling with the aftermath. The Sarawak government is soon to break ground on the Baleh Dam, and has announced plans for the Trusan Dam to go ahead in the early 2020s. So while the global trend is a shift away from these rather nasty and corrupt projects, Sarawak is still leaning in. It’s going to take continued pressure and support for environmental activists in Sarawak, and their allies around the world, to put an end to these policies. While we can say that mega dams started to go out of fashion in 2017, we can’t wait for the day we can say they’re history.